Motorola was once one of the most successful phone manufacturers, but things quickly changed for the company. The smartphone revolution swept the company across, and it hasn’t quite picked itself up since then. Although they adapted to Android quickly enough, their phones weren’t quite the success stories they once were. With the likes of Apple, Samsung, HTC, Sony and LG battling it out, Motorola faced stiff competition and their decline continued. Motorola took a leap of faith with their latest flagship, the Moto X, and it was quite the success story. The use of stock Android with little customizations (which are quite good, btw) and timely updates made the phone a success. Following up with an equally better smartphone will be a hard task for Motorola. Fortunately, trusty rumor mill brought along quite a few pictures of its purported successor so you can see exactly what Motorola has been cooking this past year. The purported ‘Moto X+1’ appears to be in a ‘near final prototype’ stage. 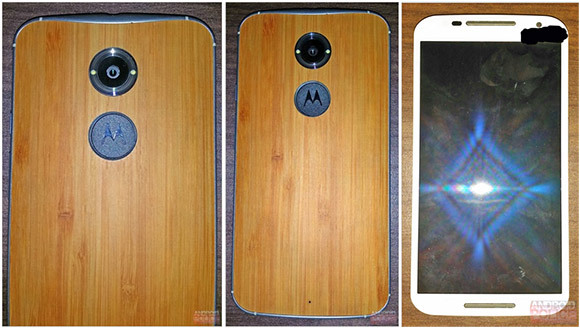 Still we can see the resemblance, as the device features a similar footprint to the Moto X. The Moto E style front speakers are also present. The tipster claims that the silver accents on the side are made of aluminum. The back features wood accents and an interesting alignment of the dual-LED flash, placed at 9 and 3 o’clock each. Below the camera is a Motorola logo, finished in what appears to be some sort of grippy texture. The Moto X+1 is rumored to sport a 5.1-inch Full HD display, Qualcomm Snapdragon 800 SoC, 2gigs of Ram and 32GB of internal storage. A microSD card slot is also present to further increase storage space. The camera will be upgraded to 12MP and 5MP back and front respectively. Last but not the least, the phone is reported to pack a 2900mAh battery. A compelling leak, but you may want to take this bit with a pinch of salt as everything said may not be a 100% accurate. Moving on, the source did not mention a release date, but a Q4 2014 release is a safe bet.